Time for another Friends on the Fives post. 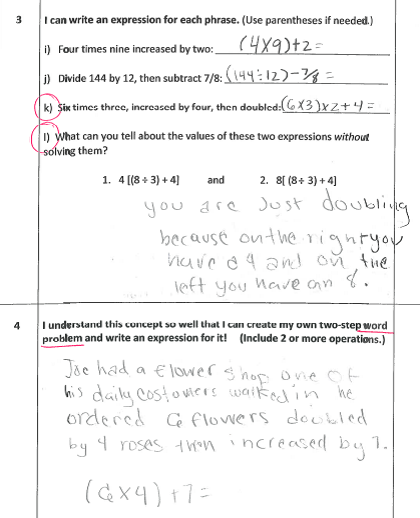 Today I bring you Mrs. L from Mrs. L's Leveled Learning! As a teacher, I usually felt like I got to know my kids pretty quickly; 7-8 hours a day in one room, need I say more? Even as a gifted resource teacher, I looked at the qualifying scores and said well, after two-three weeks I have a general idea of how this particular child is going to perform, and what personal set-backs they might have: procrastination, unorganized, perfectionistic, inattentive, doesn't like group work, etc. What got me is trying to organize the vast array of skills, stated and discreet, that are necessary for each child to master every standard. Not only did I have to consider my target goals, but think about where these kids were coming from, the knowledge of previous grade levels, which we all know can vary depending on who taught them before! Uhhh.... I attempted to do this one topic at a time, giving quizzes as a pre-assessment, and then building instruction off of that. The problem was that even once I knew which kids were low, medium, or high in one topic, then I had to spend time figuring out where to start instruction for each group, what the goals should be, and make new quizzes and resources to teach and reassess each group. Too much to organize and not enough time to do it! Learning Goals and Scales helped me! 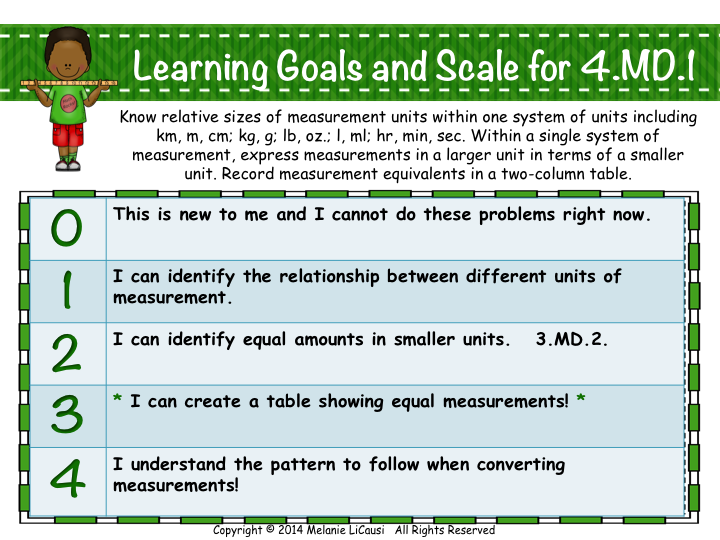 When I was first asked to use Learning Goals and Scales in my classroom, I thought, "Okay, the research supports it and this could really help me streamline skills, but who has time to do all that work themselves?" I wasn't sure where to start. Most of the teachers I worked with were constructing their own Learning Goals as grade level teams which worked great if you had a team on-site. I was traveling between two schools, teaching three-four grade levels of math in an hour and a half a day to a multi-age advanced class, fitting in consultation time with the lower grade level teachers, and managing testing referrals and data. Every other Gifted Resource teacher in my district was in the same boat; we made a good attempt to get together, and interest was high, but follow through tapered off over a few months because we had so much to do! Language Arts seemed a lot more manageable for me, but math, with it's plethora of implied skills and vocabulary, seemed trickier to keep organized. This motivated me to start here; I spent over 120 hours creating Scaled Math Assessments with Learning Goals and Scales for grades 4, 5, and 6, which I was currently teaching the most. I spent these hours reading, researching, and creating Learning Goals and scales for each standard that drew from previous grade levels and future grade level skills. Since I had taught so many different grade levels of math, I had a good idea where to look for standards that progressed. 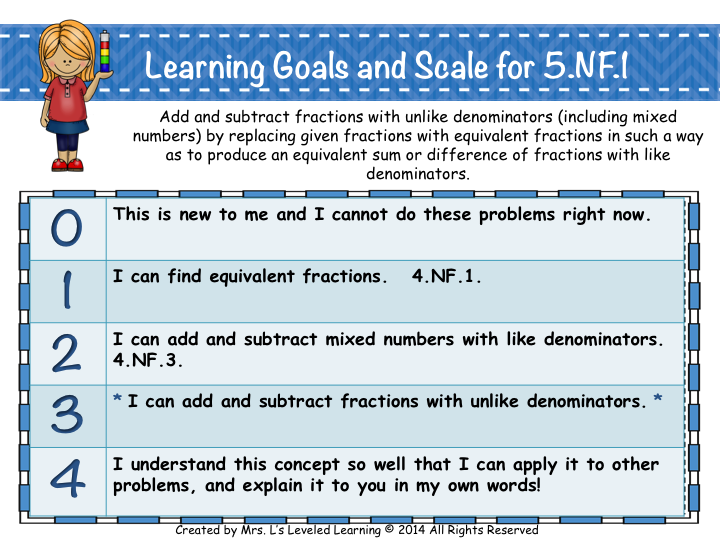 Here are some examples of posted Learning Goals and Scales from my classroom. When I introduced the Scaled Assessment as a pre-assessment, they enjoyed the fact that there was no pressure to know everything right away. They completed as much as they could, and I graded it so I could share their progress with them. The next day I would return it so they could see how far they'd gotten. Depending how much time I had, I would either return it individually, let them peruse it for a few minutes, then move onto the daily lessons; or I would return it in small groups based on performance level (1s together, 2s together, etc.) and meet with them to go over the test and skills. I would usually spend time going over the next skills so they would have an immediate goal to focus on in class. I would only fit in a meeting with each group about once a week, but it was better than nothing. The kids seemed really motivated to progress and felt like they were 'cheating' because they got to see the test in advance. I used the same exact test as a post-assessment, and the kids really loved being able to see the scales they'd already mastered and skip ahead to finish the test faster! Those who had gotten really far only had to complete scales 3-4. Those who had more to learn, had more work to do, but this was okay because it also helped me to manage the environment. I would have 1-2 "When You're Done..." activities up on the board for the kids I knew would be done quickly. I made sure there were quieter areas of the room for the kids who would need the whole period to finish. I didn't feel like I was letting the kids "cheat" because first of all, there were usually 2-4 weeks between the time they took the assessment as a pre-test, and a post-test. It was very unlikely they were going to remember the problems. Secondly, kids learn through repetition and practice, and the more they get to see and hear the learning goals and examples, the more likely they will be conscious of their learning. When kids are conscious of their learning, they are much more likely to take ownership of it! THIS IS THE GOAL! Teach kids to realize that they have charge of their learning, not just me! I can't tell you how proud and happy they were to SEE their progress and feel like they had more than one chance to master it!! 1. 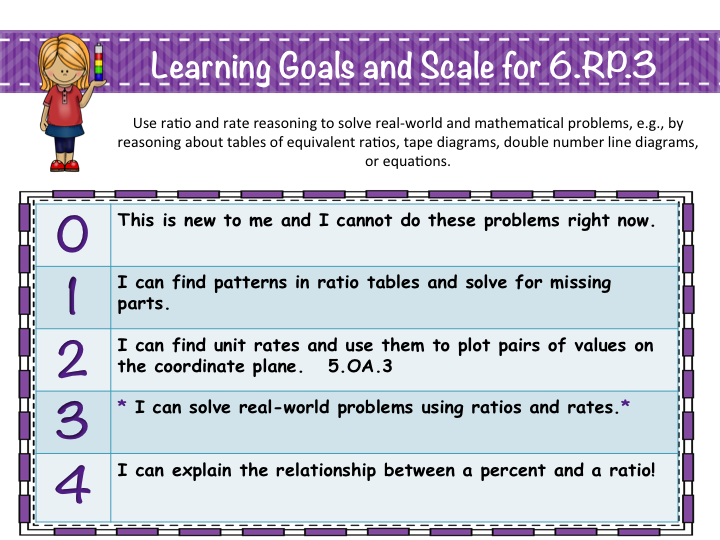 Learning goals and scales help kids see a concrete progression of skills, instead of making their own assumptions about where they are going, and how far along they've come. An informal way of implementing this is to ask your students, "Here's our learning goal today...show me on your fingers where you think you're at with converting fractions to decimals...0...1...2...3...or 4?" This is fine if it helps you make an immediate decision about where to begin instruction or review. But, how reliable is a student's opinion if they don't have the same frame of reference that you do? Do they understand what concepts they've learned that have set them up for successful comprehension of this skill? Do they know where their going with it, or what its purpose is? How many of us as adults can evaluate ourselves when we don't know what we don't know! 2. Kids love affirmation! Don't we all! My experience in child development education and early elementary teaching have taught me that specific praise, is much more effective that general praise because it helps a child see their locus of control as internal, instead of external. Instead of saying "Good Job for getting an A on this test Janie! ", and Janie walking away thinking, "Yeah, I'm really lucky! I wonder how I did that?! "; you can say, "Janie, on your pretest you could only add fractions with the same denominator using blocks, now you can add fractions with any denominator and explain how! Excellent work!" Janie can walk away thinking, yeah, I really learned something!" 3. Kids will know exactly where their learning and grades are coming from! After every single test, as if it were some unwritten ritual, students would brag, hide, and compare their test scores. Sound familiar? The most painful thing is to see those little jaws drop and faces turn red when they didn't score as well as they thought. "But, why did I get a 'C' Mrs. LiCausi?" (Even B's were a disappointment to those high-achievers!) I received a lot fewer questions from students and parents when I could point out the progression of skills that a student had mastered or not, to get them to that place. When scales are aligned to specific grades, students can make a clear connection to their level of mastery and their final grade. 4. Clear and specific guide for planning and assessing student progress. If you aren't lucky enough to work for a district that thoroughly plans your curriculum and mapping guides, then you know the painfully time-consuming process of sitting down with a year's worth of standards and trying to organize all those ideas, and break them down into manageable chunks for your students. The school year gets busy fast, and every time you switch topics and pre-assess your students, you're starting all over to figure out how to teach them where they're at, differentiating for different levels, and assessing again. If you've got learning goals and scales in order, the process goes so much faster because some of the thinking is done for you! You can move onto the fun part like planning and searching for awesome lessons! 5. Parent communication is greatly enhanced when they really know what their child is doing! How many parents remember what they learned in elementary or middle school math? How many skills or vocabulary terms are still fresh in their mind? I found that sharing the learning goals and scales with my parents, allowing them to see the student portfolios with their child's assessments and some key classroom assignments, made things more clear to them. They were more cooperative if their child needed help, and more confident that they knew what their child and I were doing all day. 6. Administrator observations and evaluations go much more smoothly when you can show that you have a concrete plan of assessment and differentiation for the standards. How great would it be to have your administrator walk into your room and say, "Wow, you really have things organized!" or "Wow, I can see exactly what you are assessing your students on, and I will fully support you in doing what you want to get them proficient!" Most of us want to be more than competent, we want to be inspirational! We want to see kids light up with pride and enthusiasm, and be recognized for making that happen. I know I felt the most satisfied in my job when I was trusted enough to have the freedom to try new things, new curriculum, or new methods. In my experience, when I established professional credibility, I was recognized and supported by administrators and peers in doing things the way I wanted to. I enjoyed teaching more, and felt more confident in what I was doing. "The starting place for all effective instruction is designing and communicating clear learning goals." "If teachers aren't sure of instructional goals, their instructional activities will not be focused, and unfocused instructional activities do not engender student learning. "Our collective goal is that the largest possible percentage of our students get there. To reach that goal we must define for ourselves and for them where "there" is. " "Learning targets convey to students the destination for the lesson - what to learn, how deeply to learn it, and exactly how to demonstrate their learning. In our estimation [Moss & Brookhart, 2009] and that of others [Seidle, Rimmele, & Prenzel, 2005; Stiggins, After, Chappuis & Chappuis, 2009], the intention of the lesson is one of the most important things students should learn. Without a precise description of where they are headed, too many students are "flying blind." - Moss, Brookhart, Long  Knowing Your Learning Target. Educational Leadership. Who has time to waste on ineffective approaches? Mrs. L (Melanie LiCausi), lives in Arizona and has taught grades 1-8 in the classroom, or as a gifted resource or math instructor for individual classes. Visit Mrs. L's Leveled Learning to find out more!